Emerson J. Dillon Middle School students cheer on their teammates during a recent team-building exercise. 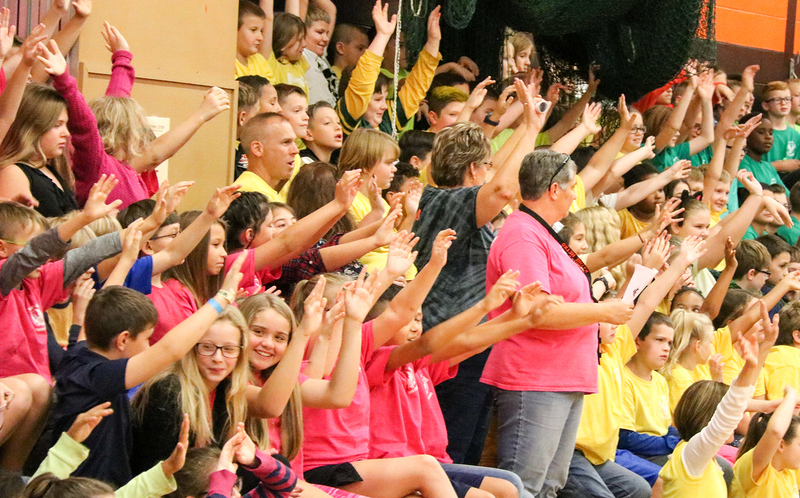 PHOENIX – With a focus on embracing positive character traits and creating a unified student body, Emerson J. Dillon Middle School students recently participated in a “Dillon Way” kickoff ceremony. The Dillon Way is a lifestyle for students and staff alike that reinforces teamwork, leadership and positive behavior en route to a successful school year. Principal Sue Anderson and the Firebird mascot sparked the students’ enthusiasm during a brief ceremony to officially kick off the day’s activities. 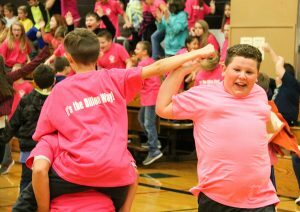 Students from each grade level paraded around the gym with banners they created that showed what the Dillon Way means. The banners boasted that respect plus responsibility equals success. Those qualities were demonstrated throughout the day during relay races, classroom presentations, challenges and team events that showcased the importance of working with one another toward a common goal. During the school year, teams from each grade level will earn points for exemplifying the Dillon Way. When the points are tallied in the spring, the team that earns the highest amount will be rewarded with a celebration day.